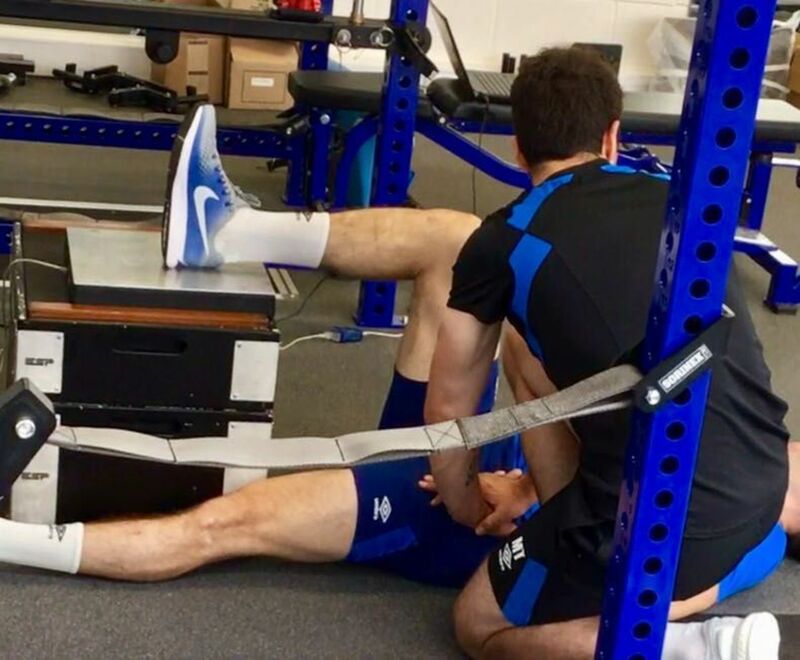 In this video-supported education review with a strong clinical slant, I outline the rehabilitation of an English Premier League footballer who suffered a proximal hamstring intramuscular tendon injury during competition. The conceptual goal was to mechanically load the muscle–tendon unit hoping to improve tensile strength, elastic stiffness and cross-sectional area. Adequate high and maximal speed running exposure and objective neuromuscular performance data informed progression through rehabilitation and RTP. The player returned to competition in 120 days and remained injury free 13 months later. During rehabilitation following initial physiotherapy care, isometric hamstring exercises were prescribed, beginning with single-leg heel drives (figure 1), progressing to unloaded, then loaded bilateral isometric hip extension holds (online supplementary video 1), then single-leg hip extension holds (online supplementary video 2) emphasising pelvic control before adding dynamic perturbations (online supplementary video 3). These high-intensity isometric exercises, using maximal voluntary contractions (~3–5 s) in cluster sets (ie, 5×5–3–5 s) were included with the theoretical aim of providing cyclic high-strain magnitudes postulated to increase tendon/aponeurosis stiffness, reduce tendon/aponeurosis strain and enhance force development. I mention these mechanistic elements for discussion while being clear that there is no evidence that these hoped for stimuli, or their downstream effects, are being delivered with this programme. A future challenge is to try to study these processes in vivo. Progression of isometric strength exercises for hamstring-tendon loading. 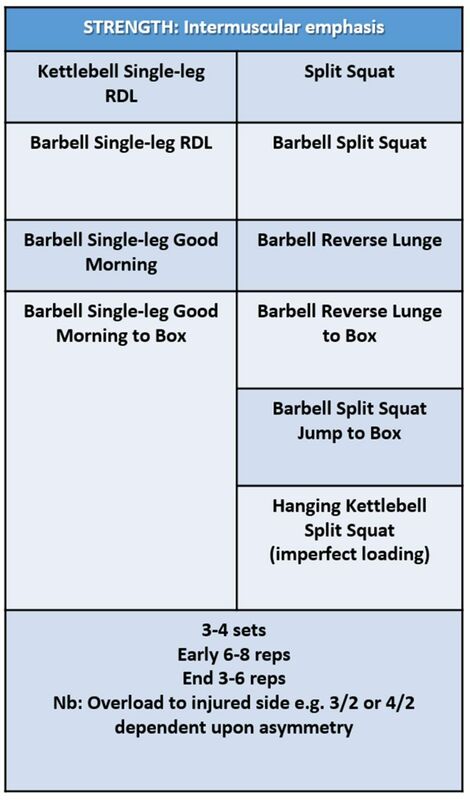 In conjunction with isometric hamstring exercises, dynamic exercises, including bilateral gluteal bridging, were introduced, and full range of motion unloaded split squats (online supplementary video 4). In my mechanistic model, this would promote collagen synthesis and fibre alignment, and improve tendon tensile strength. Gluteal bridging was progressed in three ways; increasing the lever arm and effective load by elevating the feet, adding load (online supplementary video 5) and selectively overloading the injured limb (online supplementary video 6) to provide a stability challenge alongside increased load. Resistance bands (online supplementary videos 7 and 8) were also used to vary the velocity of contraction and reactivity (figure 2). 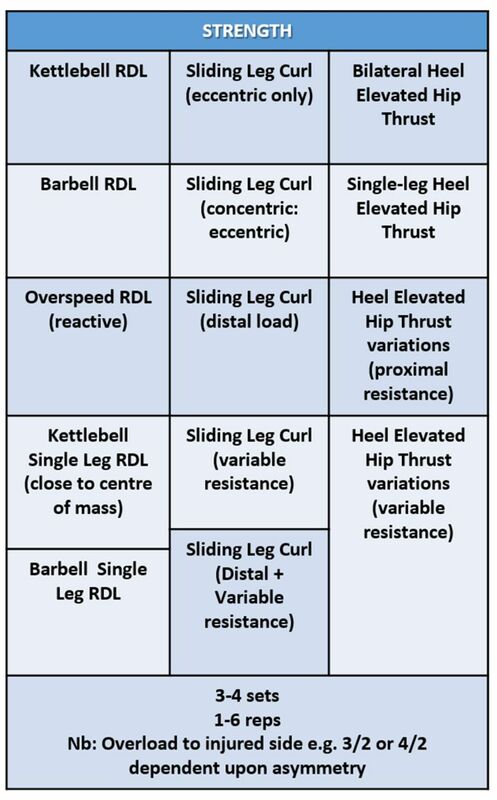 Progression of strength exercises for hamstring–tendon loading. The Romanian deadlift was the principal hip-dominant exercise selected, progressing from bilateral (online supplementary videos 9 and 10) to unilateral (online supplementary video 11), increasing recruitment of the injured muscle group, to target hip extensor strength asymmetry. The reverse lunge (online supplementary video 12) was the principal unilateral knee-dominant exercise selected to develop knee/hip extension strength, with a focus on acceleration mechanics, providing a foundation for more advanced variants (figure 3). Again, we postulate that this would promote intermuscular adaptations specific to the demands of high-speed running (HSR). Exercise progressions focused on increasing intermuscular co-ordination demands, similar to the proximal to distal activation pattern observed during the stance phase of gait, optimising energy transfer from hip to knee and from knee to ankle (online supplementary videos 18, 19 and 20). Progression of strength exercises with intramuscular emphasis for hamstring–tendon loading. 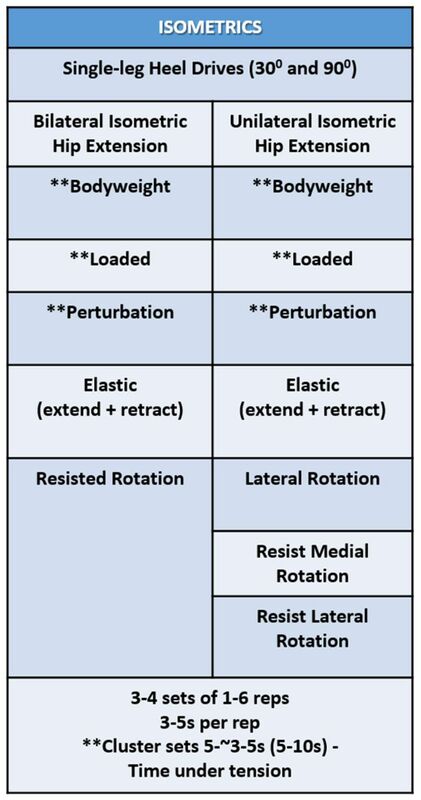 At week 7, my criterion for phase; progression peak force (PF) asymmetry ≤10% in a force platform isometric posterior chain (IPC) test5 (figures 4 and 5) was achieved, allowing progression of exercise selection to emphasise hip extension and eccentric knee flexion. The eccentric-only sliding leg curl (online supplementary video 13) was introduced, then progressed in volume from 2×4 reps to 4×5 reps, followed by the eccentric–concentric version (online supplementary video 14), adding distal load (online supplementary video 15) and resistance bands (online supplementary video 16) to increase speed and strain rate of the eccentric phase, and reactive demands (figure 2). Isometric posterior chain peak force and asymmetry during hamstring–tendon rehabilitation. At week 9, IPC test PF asymmetry was <10%, my criterion for jump-landing and plyometric activity integration (figure 6), part of a multidimensional approach to enhance lower limb stiffness, neuromuscular control and landing biomechanics, and promote reduced joint loading. 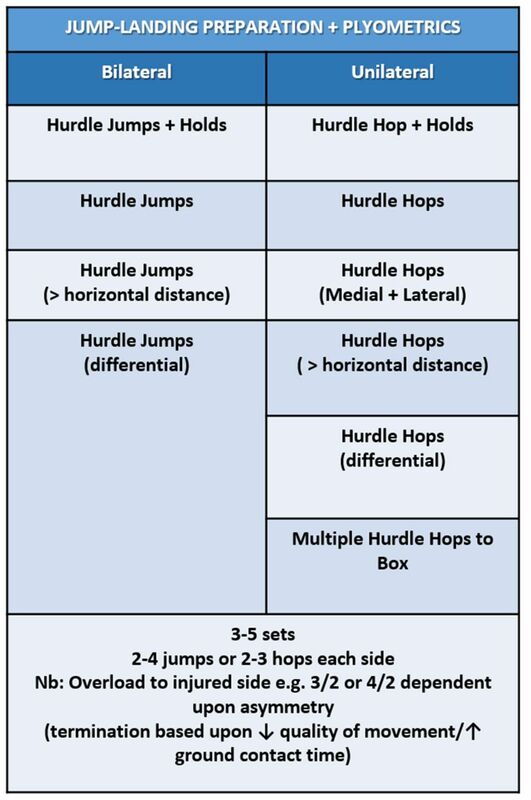 During weeks 9–10, jump-landing derivatives were introduced, followed by progression to plyometric activities in weeks 11–14 (figure 6) to target fast stretch shortening activities (<250 ms) reflecting HSR ground contact times (online supplementary video 21). Achieving <10% PF IPC asymmetry was also my criteria for beginning outside preparation. Gradual exposure to high running velocities including >5.5 m s−1 (online supplementary video 22) was initiated in week 10 and included periodised exposures to relative HSR early in the week (figure 7). An acute ramp in relative HSR began after IPC test force at 100 ms (an indicator of rate of force development) asymmetry was <10%, suggestive of a positive adaptation specific to exposure to the increased load and velocity demands of HSR. Progressive increases in involved limb PF and force at 100 ms drove reduced asymmetry in these variables, and total PF reached 300 N during weeks 13–14 (figure 4 and figure 8). In addition to IPF asymmetry, identified as a risk factor for HSI recurrence,6 prior to RTP eccentric knee flexor strength, assessed using the ‘NordBord’ (online supplementary video 17) was 500 N (13% improvement relative to preseason on the involved side), well above the 350 N HSI risk threshold,7 with asymmetry <10% (figure 9). Progression of jump-landing and plyometric exercise for hamstring–tendon loading. High-speed running (HSR) exposure and isometric posterior chain testing during hamstring–tendon rehabilitation. Isometric posterior chain peak force and relative peak force during hamstring–tendon rehabilitation. Eccentric peak force and asymmetry testing (NordBord) at baseline (Pre-season) and prior to return to play (RTP). . Acceptable asymmetry was my criterion for exposure to higher cumulative weekly HSR workloads and subsequent progression to loads reflective of relative game load HSR, maximal speeds and positional requirements (online supplementary video 23), and to increasingly chaotic running patterns (figure 10. Global positioning systems data were used to ensure gradual return to acute and accumulated weekly HSR distances as large increments can increase re-injury risk,8 and adequate exposure to sprints above 90% maximum velocity (online supplementary video 24), potentially protective against muscle injury.9 The player achieved a new maximal speed during the RTP phase (figure 11). Percentage of relative maximal speed and isometric posterior asymmetry testing during hamstring–tendon rehabilitation. 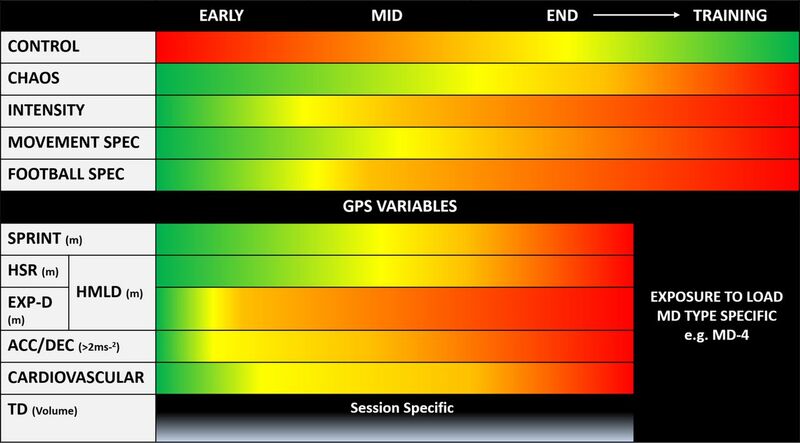 In the ‘fast’ elite sports environment, decision-making throughout rehabilitation was underpinned by research, clinical evidence and experience.10 Progression wasdriven by delivery of specific loading stimuli in both on and off pitch conditioning, assessed with neuromuscular tests quantifying the player’s response to load. These data then informed decisions to facilitate a successful outcome, blending art and science. Contributors MT led the rehabilitation and planned and wrote the manuscript. DDC provided guidance and assisted in the writing of the manuscript. Competing interests DC is a co-founder and shareholder in a company that makes force platforms and force platform software.